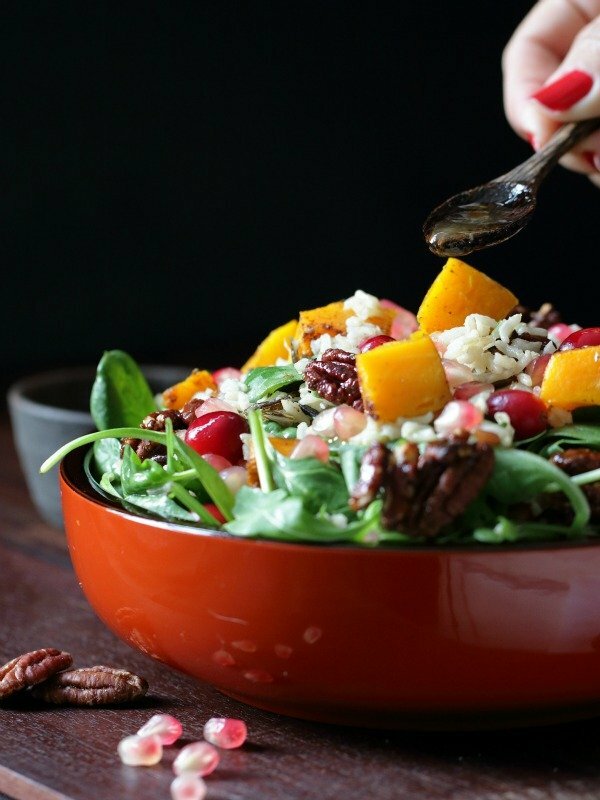 Festive Autumn Salad is filled with naturally sweet roasted butternut squash nested in a bed of peppery rocket, spinach, crunchy pomegranate seeds, cranberries, drizzled with a ginger maple citrus dressing and topped with candied pecans. Bam's Kitchen is working in collaboration with Crazy Sales.com.au to bring to you an awesome Festive Autumn Salad recipe, holiday shopping ideas and an Australian Giveaway. You are just going to love this simple and easy festive autumn salad as it is filled with so many healthy ingredients and all of the autumn harvest all in one delicious bite. 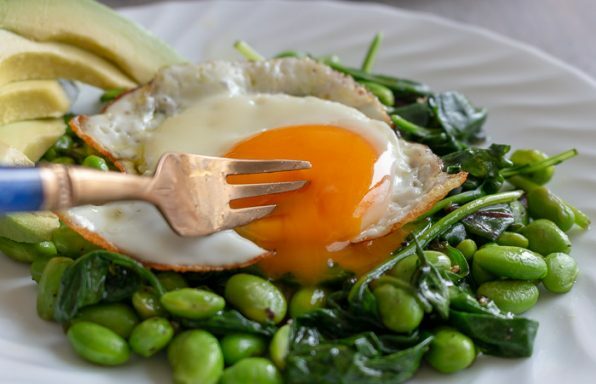 This salad is also happily gluten-free, paleo-friendly, dairy free, and egg-free. My dad used to tell me...“If you’re shopping seasonally for fresh fruits and vegetables, most items from that are ready to harvest at the same time blend together beautifully." You know Dad's are always right! 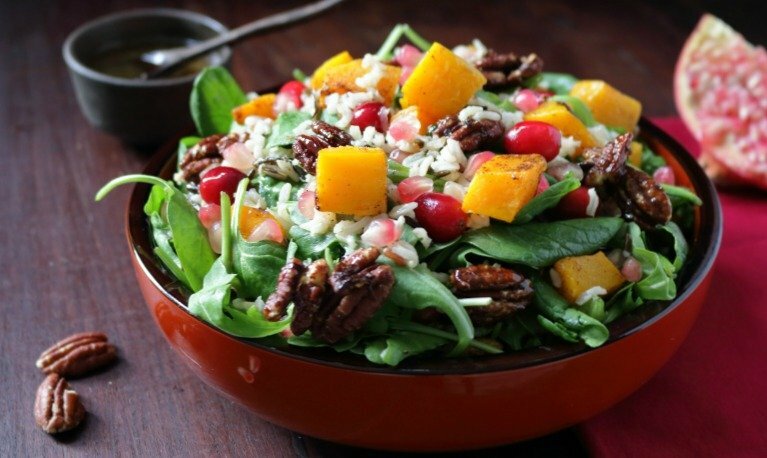 You can use any fruits/veggies in season such as apples, pears, persimmon, and roasted pumpkin would all work beautifully in this salad. Dried fruits are also beautiful in this salad. 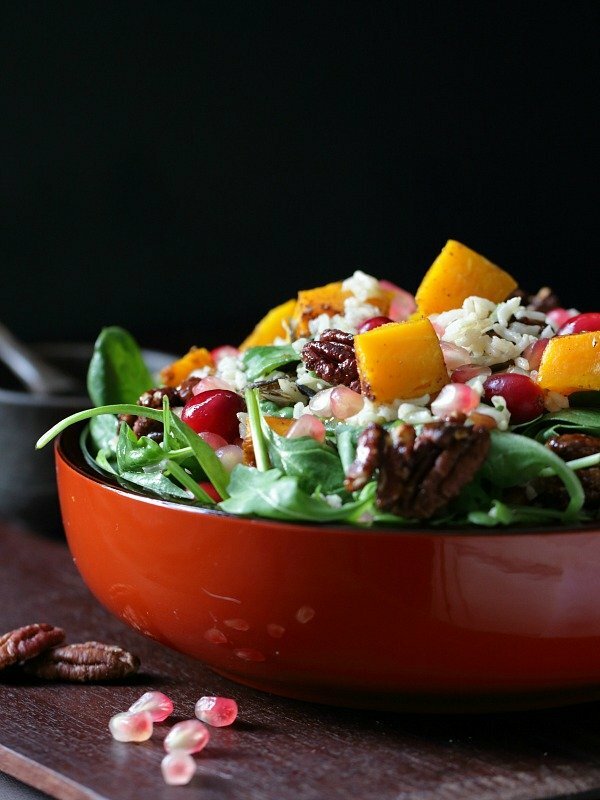 Festive Autumn Salad is the perfect dish to pass for all of your holiday gatherings. You make your ginger maple citrus dressing, candied stove top pecans and roasted butternut squash in advance and then all you need to do is dump in a bowl and toss and you are good to go. 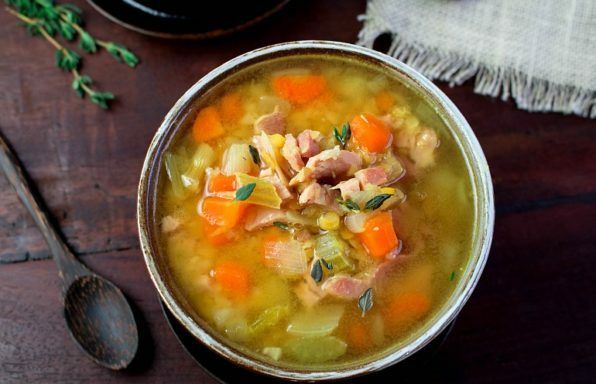 Fast and easy and around the busy holidays you need lots of shortcuts to make your life easier. 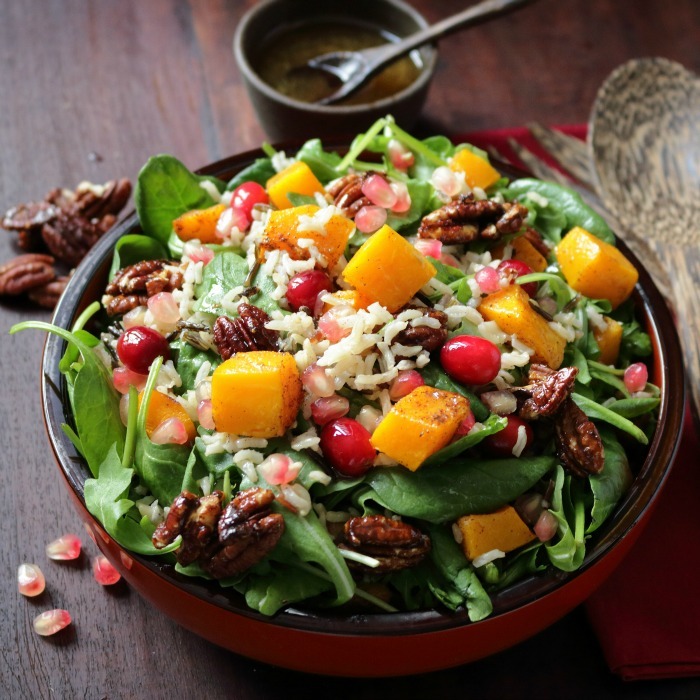 This Festive Autumn Salad is so colorful that it could be the centerpiece on your holiday table and how pretty would this salad look nestled next to a slice of turkey or ham. 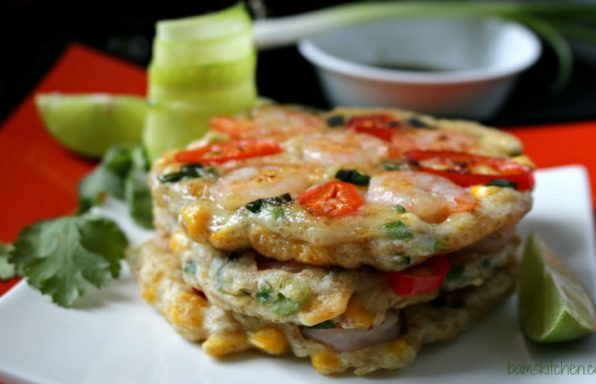 This is one dish that all the vegan family and friends can enjoy too. 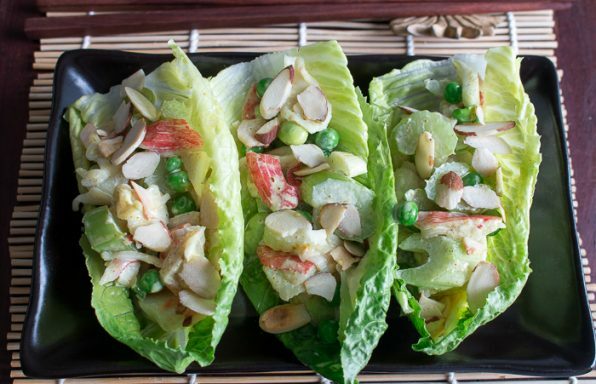 The ginger maple citrus dressing makes this salad extra special. 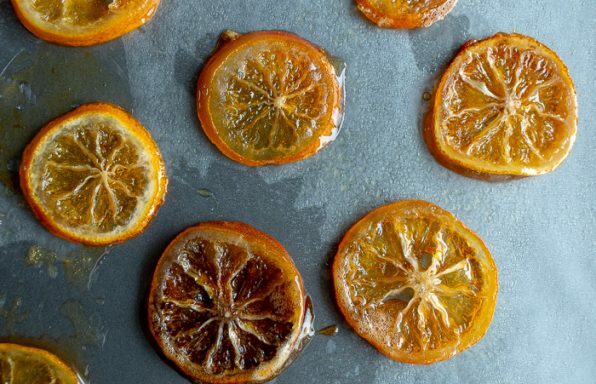 Ginger, lemon, lime, cinnamon and a little drizzle of maple syrup are blended with perfect harmony. The sweet, the savory and the warming spices and roasted autumn butternut squash all make a perfect harmony of flavors and textures. My favorite addition is the candied stove top pecans. Candied stove top pecans are so addictive delicious so you better make a little extra because I promise at least half of them will be gone by the time you get to serving up the salad. 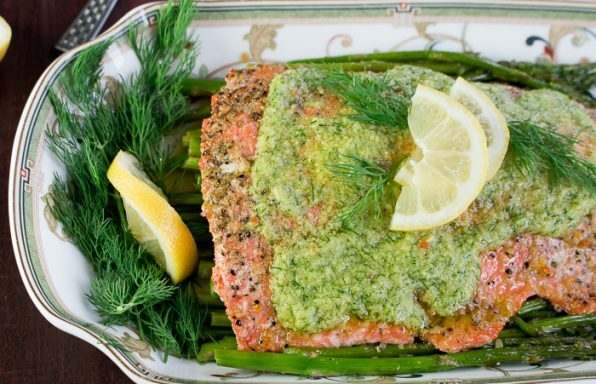 The only ingredient that I would change is to add dried sweetened cranberries (cranraisins) into this dish instead of fresh. The fresh cranberries are too tart and don't have that delicious chew like dried. Crazy Sales.com.au, an Australian online shopping site with heaps of bargains everyday, is sponsoring a giveaway to all of Bam's Kitchen' Australian readers for your own beautiful Maxkon Food Dehydrator with Adjustable Trays. Now you can make your own dried fruits, vegetables and delicious dried cranberries for this Festive Autumn Salad without having to worry about strange additives, preservatives or loads of extra sugar. Believe it or not, it is only a couple of months away until the holidays. Really! Where did this year go? If your living in Australia, your holiday shopping could not be any easier. You can shop at Crazysales.au.com for all of your holiday shopping from the comfort of your home in your yoga pants and fuzzy slippers. There is no need to fight the traffic or stand in the long lines. You got to love that! Crazy sales.au.com has everything from appliances to home and garden to baby's kids, pet supplies and toys to tools and auto and everything in between. Being the foodie I am, I have my eye on the Electronic Ice-cream, Frozen yogurt, Gelato and Sorbet Maker, Maxkon Vacuum Food Saver Preservation Heat Sealer and the Portable Induction Cooktop as I would love this to cook hot-pot and sukiyaki. Just imagine how happy you could make your family and friends with one of these great gifts. 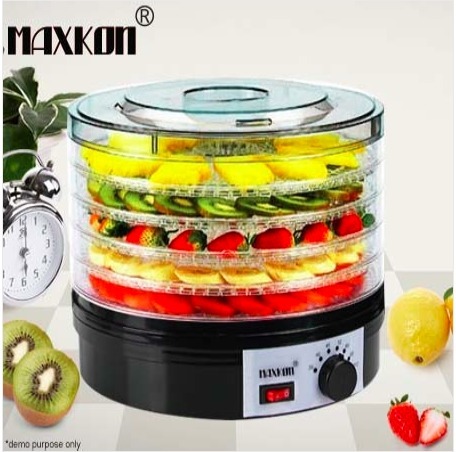 For all of my Australian readers, please take a moment to enter the Crazy Sales.com.au Maxkon Food Dehydrator with Adjustable Trays Giveaway. For all readers living outside of Australia, I have some fun activities coming up in next months posts. So stay tuned for details and check out this recipe for the Festive Autumn Salad. The CrazySales.com.au GIVEAWAY is open to Australian residents only. The giveaway will be open from October 28th to November 4th and a winner will be chosen on November 6th. In order to qualify for the giveaway, you must leave a comment with your Australian state territory that you reside in, tweet this recipe and describe your favorite dried fruit or veggie. 1Bake the butternut squash. Preheat oven to 400 degree F (204 degrees celsius). Toss the peeled 1 inch prepped butternut squash cubes in the coconut oil, cinnamon and salt and pepper to taste. Bake for about 20-25 minutes or until the butternut squash is fork tender. 2Cook your brown and wild rice mixture according to package instructions.- about 40 minutes or until fork tender (Adding brown and wild rice to the salad is optional but I find that this makes this salad a complete meal) You could also add lentil instead. 3Make your stovetop candied pecans. In a small pan add your pecans, cinnamon and coconut sugar and turn the heat on low and allow the sugar to melt and stir gently so that all the pecans are coated. (about 2 minutes) Sometimes I like to also sprinkle just a dash of chili powder in the mix as well... Trust me these are addictive so you might want to make a little extra so you can snack along the way. 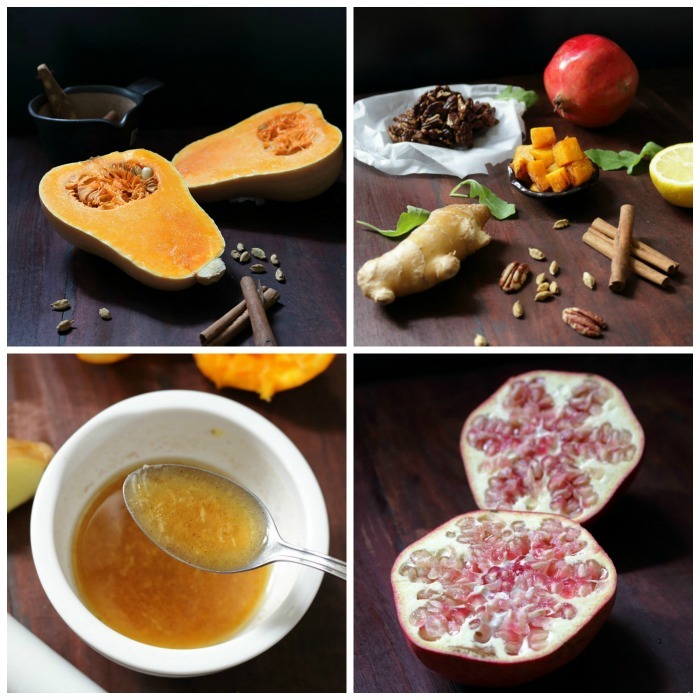 4Make your ginger maple citrus dressing. In a bowl add your lemon juice, orange juice, olive oil, grated ginger, maple syrup, cinnamon and salt and pepper to taste. If you do not have a lemon you can exchange with apple cider vinegar. Stir and set aside. 5Assemble the Festive Autumn Salad. 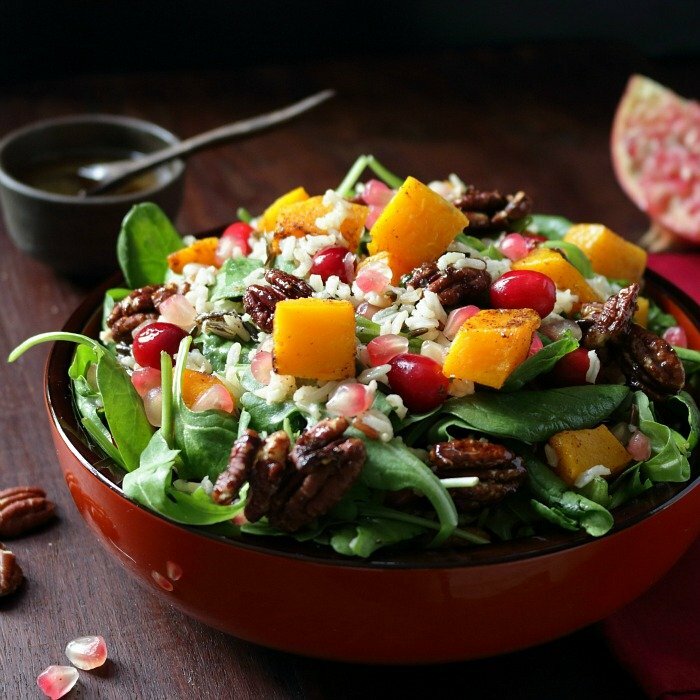 Toss together the rocket, spinach, pomegranate seeds, dried cranberries in a bowl. Sprinkle with the stove top candied pecans and drizzle and toss with ginger citrus maple syrup dressing. Enjoy!